"Jugalbandi" this book is compiled by Tarashankar's two famous novels- 'Jugalbandi' and 'Basantorog'. The authors used the historic background as a novel theme very nicely. No matter how big or small people are, all his writings show the greatness of man which is the individual landmark of his writings. Various images of social change were the subject of many novels ans stories of Tarashankar. 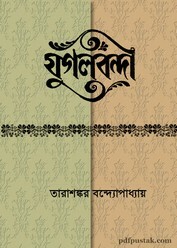 Now readers can collect the above-said book- 'Jugalbandi by Tarashankar Bandyopadhyay' as a pdf.